manufacturing, logistics and tire servicing. Why did you make ergonomics your ISE specialty? What’s the appeal of the Applied Ergonomics Conference? with others, especially those new to the ﬁeld. What are you most proud of as Michelin’s ergonomics director? I was very lucky to have had such a strong foundation and knowledgeable network. 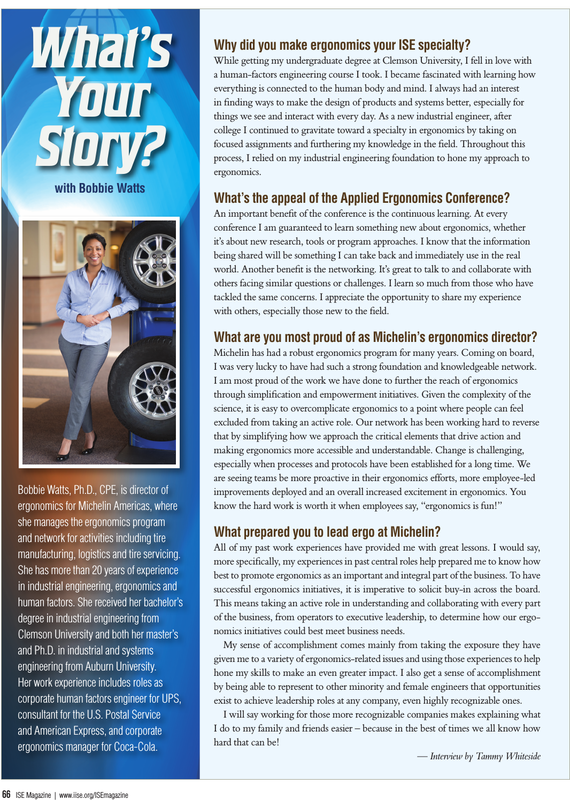 What prepared you to lead ergo at Michelin? successful ergonomics initiatives, it is imperative to solicit buy-in across the board. nomics initiatives could best meet business needs. exist to achieve leadership roles at any company, even highly recognizable ones. broke through those barriers will make your next bottleneck a piece of cake.